Powers/Abilities: Korath was a brilliant geneticist. 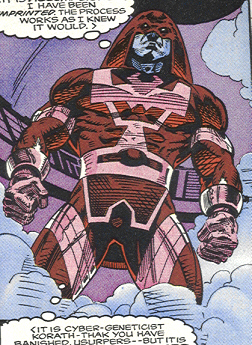 After implementing the Pursuer template on himself, Korath gained enhanced strength and durability to an unknown degree, used full body armor, used jet propelled boots which allowed him to fly, and had incredibly advanced scanners that could pick up anomalous brain patterns or power levels. He also employed the use of two "beta batons," which fired very powerful energy blasts capable of knocking out an Eternal like Sersi. He also claimed that he was trained in the ways of the ancient Kree, whatever that means. History: (Inhumans#11 - BTS) - Korath-Thak designed the Pursuer project on behalf of the Kree. The Pursuer project consisted of a super powered template that could be applied to materials or living things, transforming them into super powered agents of the Kree. (Quasar#32 (fb) - BTS) - Korath and several other scientists were dismissed by the new leaders of the Kree, Ael-Dan and Dar-Benn, and the Pursuer project was canceled. This left Korath bitter, unsatisfied with the Kree's new rulers, and with the belief that the Kree empire was decaying. He was reassigned to a small world in the outskirts of the empire, but he took the technology of the Pursuer project with him. (Quasar#32) - Enraged at how he had been treated by Ael-Dan and Dar-Benn, Korath used the Pursuer template on himself, becoming super powered and genetically enhanced, dubbing himself Korath the Pursuer. (Captain America I#399) - Korath was summoned to Hala by the Supreme Intelligence, along with Shatterax and Ultimus to become part of the Kree Starforce. The Supreme Intelligence instructed the three that the Avengers were somewhere on Hala and needed to be captured. The three super powered Kree scattered and searched for the Avengers, but it was Korath who found them by pinpointing their non-Kree brain patterns. Korath surprised the hidden Avengers and immediately knocked out Sersi and Crystal with his batons, having scanned them as being the most powerful in the group. However, before Korath could press his advantage, he was jumped by Captain America. Captain America quickly realized that he could not defeat Korath by might alone, and hit Korath's wrist, causing him to drop one of his batons. He then jumped on the air-borne Korath and clung to him as they flew high over the city. Captain America grabbed Korath's remaining baton and used it to disable Korath's jet propulsion boots. Without any means of flight, Korath fell to the city below while Captain America returned to his allies in the Avengers. (Avengers I#346) - The Supreme Intelligence lied to Starforce and Korath, telling them that the Avengers intended to assassinate the leaders of the Kree. Supreme Intelligence then sent Korath and the rest of Starforce to capture the Avengers. Though the Avenges managed to hold their own for a little while, they became slowly but surely overwhelmed by Starforce. The battle ended when Deathbird slew the leaders of the Kree, resulting the Supreme Intelligence assuming leadership of the Kree again. The Avengers were all taken into custody. (Thor I#446) - The Supreme Intelligence sent Korath, with Starforce, to the Throneworld of the Shi'ar to assassinate the ruler of the Shi'ar, Lilandra. The Starforce found, however, that they first needed to contend with the Imperial Guard and another squadron of Avengers that had gone to the Shi'ar galaxy. 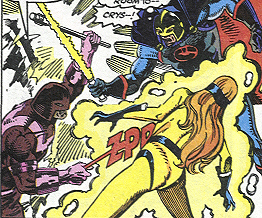 Korath engaged Astra and the Scarlet Witch in battle, and zapped the intangible Astra with his beta batons by adjusting them to her density. However, the Scarlet Witch used her hex powers to cause a malfunction in his batons, and Korath was soon incapacitated by Astra when she turned intangible, entered Korath's body, and increased her density until Korath blacked out. (Avengers West Coast#82) - Lilandra sentenced Starforce to death, but the Avengers opposed this, and fought the Imperial Guard over them. (Avengers I#347) - After the decimation of the Kree empire, Lilandra assumed leadership of the Kree, and set Deathbird to rule the planet Hala, with Starforce (including Korath) as her own Imperial Guard. (Quasar#35) - Starforce intercepted Quasar and his allies Makkari and Her on Hala. Although the three heroes had come to assist Hala in rebuilding the planet, Deathbird did not believe them, and instructed Korath and the others to attack. Quasar and his friends fled to avoid a pointless battle. (Silver Surfer: Breakout) - The prison breakout of Admiral Galen-Kor and his criminal cohorts gained the attention of Deathbird and her guards Starforce. Galen-Kor's allies took one starship apiece and fled the planet's atmosphere, with Deathbird, Korath, and Shatterax in hot pursuit. The battle was joined by the Silver Surfer, who had heard rumors of Hala's prison population overrunning the planet and came to put it down if true. He disabled one craft, but the other three escaped into 'hyperspace'. When Lilandra arrived she ordered Deathbird and the Starforce back to Hala to quell the revolt there while the Imperial Guard pursued the other escapees. (Blackwulf#7) - Following the path of destruction caused by Tantalus, Starforce came upon members of the Underground Legion, who were pursuing Tantalus. After a brief skirmish, Starforce offered their assistance. (Blackwulf#8) - Starforce and the Underground arrived on Armechadon, where they joined forces with the Underground of Armechadon against the armies of Tantalus. (Annihilation: Ronan#1 (fb) - BTS) - When the Kree Empire regained its autonomy, the members of Starforce were branded defectors. Korath wound up settling on Godthab Omega. (Annihilation: Ronan#1) - Korath was reunited with Ronan when he came to Godthab Omega in search of Tana Nile, who had testified against him in court, causing him to lose his status as an Accuser. Korath informed Ronan of the Graces, a team of women led by Gamora who counted Tana Nile among their number. When Nebula and Stellaris suddenly attacked the duo, Korath was knocked out, and Ronan fought the women solo. (Annihilation: Ronan#2) - Korath came to and told Ronan the history of the Graces. Ronan began to suspect that someone was tampering with cosmic forces on Godthab Omega, and Korath concurred. (Annihilation: Ronan#3) - Korath saw from Ronan's ship that the Annihilation Wave was on its way to Godthab Omega. With Ronan's vessel the only means of warning the Kree Empire what was coming, Korath convinced him that he had to return to the Kree. Ronan agreed, but first went to seek the source of the cosmic manipulation on Godthab Omega. (Annihilation: Ronan#4) - As the Annihilation Wave attacked the planet, Ronan realized that the entity responsible for bringing people there-- Glorian-- would have to lift his control over them in order to battle the wave. Korath and Ronan used the distraction to prepare an evacuation of the planet with Devos the Devastator and Talos the Tamed. They went to find Tana Nile, but by the time they reached her she was dying. Ronan permitted Gamora and her remaining Graces to join him and Korath as they fled Godthab Omega for Hala to warn their people. (Annihilation: Conquest#5 (fb)) - Korath was leading a squadron of Kree forces to the colony world Khan-Lar to investigate what had become of the colony. They found Ultron and forces of the Phalanx there, and Ultron boasted that Korath would the first of his "select." After assimilating Korath into the Phalanx select Ultron asked him why he was in that region; Korath replied that the Supreme Intelligence had sent him to find the High Evolutionary, who was at work on a special genetics project on behalf of the Kree. 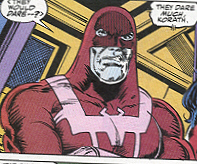 Ultron began to focus his attention on finding the High Evolutionary. (Annihilation: Conquest#1) - Three weeks later, Korath joined select members Shatterax and Xemnu with the Phalanx forces sent to Terma, where they clashed with Adam Warlock, Quasar and Moondragon, but Adam Warlock spirited himself and his allies away. When Korath, Xemnu and Shatterax reported their failure to the Phalanx leader Ultron, Ultron destroyed Korath to teach Shatterax and Xemnu a lesson.